This ammunition is vintage .22 short. 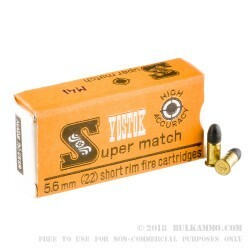 It is rimfire ammunition that was made in the Soviet Union by Vostok. The ammo was manufactured in the 1970’s for the Olympic games, and you can be sure that you are purchasing high quality 22 short ammo. 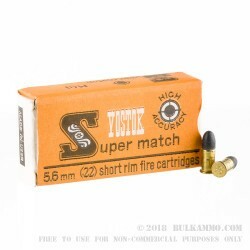 These bullets are great for a collector, or they will make for a fun day at the range. They are packaged in individual boxes of 50 that are perfect for grabbing and going to the range. You can be sure that even being almost 50 years old they will still work just like they were made yesterday. 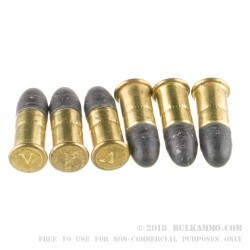 This ammunition has a 28 grain lead round nose bullet. They are encased in brass, and they offer superior accuracy, as they were specially manufactured for match shooting. You will not be disappointed in the accuracy that this ammunition will provide, and they make for a great target day at the range or competition shooting. This bulk package comes with 7200 rounds of premium .22 short ammo. It has 7 bricks per case and 12 boxes per brick that are broken down into 50 round boxes. So, you can be sure that you will have enough ammunition to last the whole day.